On August 16th 1999 I departed New Zealand for Bunaken Island with a group of New Zealand divers including several members of the Auckland Underwater Photographic Society. Getting there was not quite as easy as the South Pacific destinations which New Zealand divers more commonly visit during the southern hemisphere winter. The voyage required flying from Auckland to Singapore and then, after a one night stopover in Singapore, from Singapore to Manado . After landing in Manado and taking a boat ride of about an hour, we eventually arrived at Bunaken Island on August 18th and wasted no time in getting a taste of the warm, blue salt water that is so intoxicating to the diver coming from a cold and wet winter climate at home. We had read a bit about the place and all reports indicated the diving would be truly world class. The two dives we did on the first day did not quite live up to the expected standard but were good none the less. Further dives however revealed the area's underwater wonders. 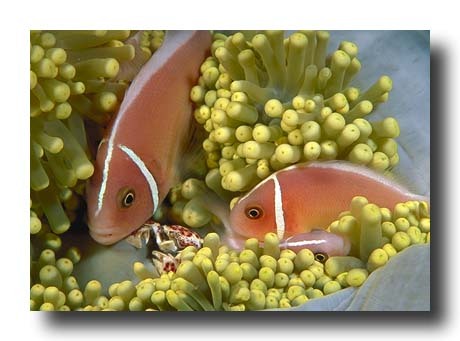 Probably the most striking quality of the diving is the abundance and diversity of marine life. For someone generally unfamiliar with the particular fish species present, the variety is not immediately obvious but as we tried to take more note of the different fish and learn something about them, the richness of the life became more apparent. Almost all dives we did were long - at least 70 minutes and some as long as 90 minutes. Each dive included a long period in shallow water where we had a good chance to observe the coral communities in detail. On some dives we spent a long time looking at the communities of tiny fish in the shallows. 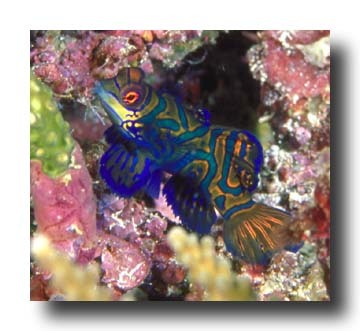 These dart around amongst the coral and are difficult or impossible to photograph. To identify such a bewildering variety of fish is also difficult but it would appear that the diversity of species of these tiny fish alone might rival our total fish fauna at home. The variety of weird and wonderful creatures was incredible too. Perhaps the weirdest of these were the Ghost Pipe Fishes. 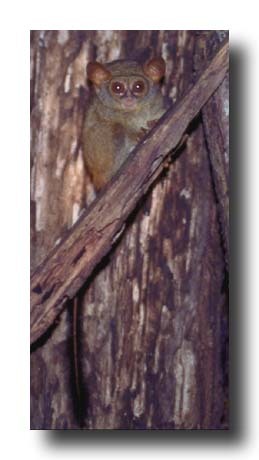 In order to view these, a good guide is needed to locate them for they are so small and well camouflaged that without intimate knowledge of their habitat and behaviour, finding them would be almost impossible. 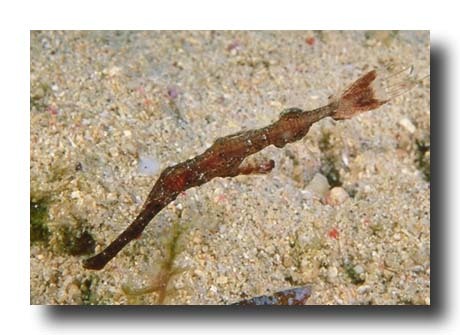 The first of these fish I saw was the Robust Ghost Pipe Fish. This was perhaps 60mm long but so slender and well camouflaged that even when it was precisely pointed out by our guide, Robert, I still had difficulty convincing myself that I was looking at a fish and not a blade of grass. Despite the strong current sweeping across the reef, this little fellow was swimming with head angled down, maintaining his position and doing his very best to mimic the blades of sea grass he swam next to. 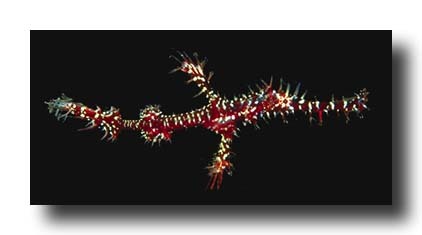 The most spectacular of the Ghost Pipe Fishes is the Ornate or Harlequin Ghost Pipe Fish. Once again, when Robert pointed out the fish, it took me some time to realise what I was looking at. 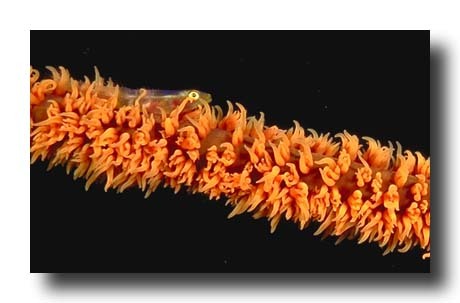 Other spectacular creatures observed and photographed included Mandarin Fish, Blue Ringed Octopus, Leaf Scorpion Fish, Blue Ribbon Eels, and dozens of different species of nudibranchs. We saw the normal tropical selection of sharks, barracuda, dog tooth tuna, giant trevally and mackerel. 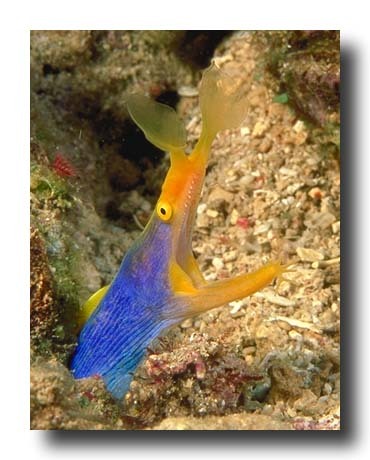 But the larger animals are not the drawcard at Bunaken, it is the small creatures which were the focus of our cameras. The marine life around Bunaken is impressive in its abundance and diversity during the day but by night it is something else again. Of particular note was the incredible variety of crabs, shrimps and lobsters visible at night. All of these animals are virtually invisible during the day but by night, come out to parade in a procession of the weird and wonderful. The larger and more spectacular of the shrimps look like some ornate space ship with all their fine detail lit up by our lights and the decorator crabs like a collection of junk lurching clumsily across the reef face when disturbed. Soon after our initial arrival at Bunaken, we were given a general briefing including a description of the underwater photographic opportunities available. 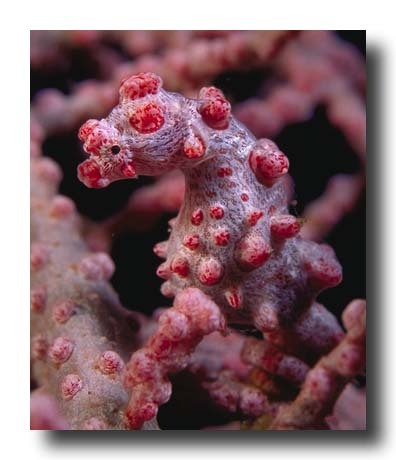 One of these was the possibility of making a special trip so see the Pygmy Seahorse. At the time, this did not have enormous appeal but because we knew that we would not be able to see these critters on any ordinary dive, we would make a point of asking our guide, Robert, to show them to us and pretend to be greatly disappointed when told that there were no pygmy seahorses at this location. So, when the opportunity came to make the trip to see the pygmy seahorses, we had no option but to accept with much enthusiasm. Getting to the location where these critters are found required a fairly long boat ride of over an hour across to the other side of the bay. Within a few minutes of commencing the dive, Robert had located a single, large, mauve coloured gorgonian fan and was pointing to spots on the fan where individual seahorses were clinging to a branch. To say that these tiny animals were well camouflaged is something of an understatement. Their body colour perfectly matched that of the gorgonian fan and the surface of their tiny bodies is even covered with dimples which mimic the polyps on the branches of the fan. Had these things not been very precisely pointed out, there is no way that they would be noticed, even on close inspection of the fan. I am afraid that in our enthusiasm to get photos of the wee animals, we may have terrorised them. This probably included some unintentional touching of the fan with strobes or framers and certainly involved many dozens of strobe blitzes. 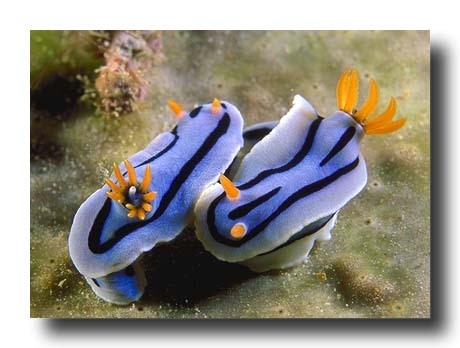 I very much hope that we did not damage them or their environment in any way because they are the cutest little animals and to view their minute faces with gills pulsing rapidly, looking more like ornamental chess pieces than living creatures was a special experience. 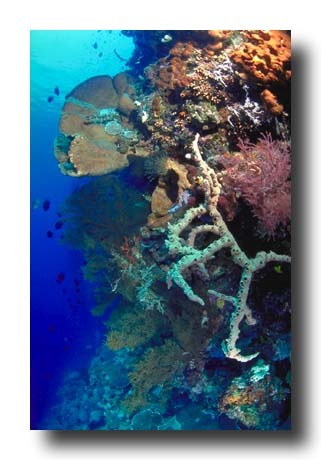 Bunaken's prolific marine life no doubt benefits from the unusual underwater terrain and currents. Every dive around Bunaken and nearby islands seems to have walls plunging vertically to great depth and strong currents to match. Most dive briefings went something like "this dive wall dive, maybe current go this way, maybe current go that way, we just drift with current". Not too far from Bunaken, depths reach several kilometres and as might be expected, at the edge of reefs fringing the islands the bottom drops abruptly in starting on its way to these abyssal depths. The guides didn't tell us not to go deep - it went without saying. We dived to nothing more than modest depths, but from 40 metres (130') the walls typically appeared to plummet vertically into the unknown. Some guides told of times when "every dive, crazy dive" to 70, 80 and 90 metres (230, 260 and 295') but the richness of the reefs is undoubtedly best experienced at much shallower depths. From these enormous depths must come upwellings of oceanic waters. On almost every dive current is present but the plan is generally to drift with it rather than swim against it. For the photographer who wants to stop to photograph something, this can be a problem but the current is also very variable and on any dive, there are periods of little or no current. On some dives there were noticeable thermal gradients in the water but most computers registered the temperature at a constant 28 or 29°C (82 or 84°F) and even after 90 minutes in water with a 3mm suit I never felt cold. We dived with Froggies Divers who ran a thoroughly efficient operation. Accomodation, also with Froggies, was comfortable but basic. 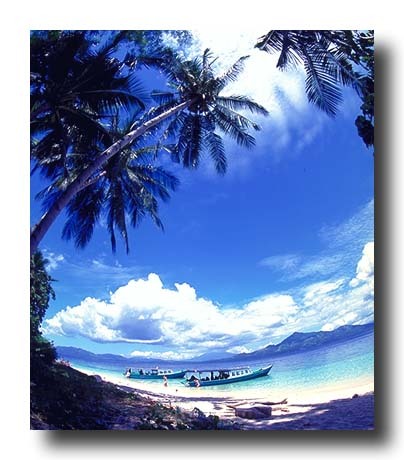 Fresh water on Bunaken has to be brought to the island from elsewhere and is in short supply. Showers were had by ladling fresh, cold water over our salty, sweaty bodies. After the diving phase of the trip was completed, we spent several days exploring the Minahasa Highlands and Tangkoko National Park. This provided an interesting complement to the diving and allowed us to gain a perspective on the local culture, cuisine and wildlife which we did not get while staying on the island. Getting to Tangkoko National Park involved a long and rugged drive over some less than wonderful roads. On arrival we had little time to relax before going on an evening walk through the forest. After seeing very little for quite some time we were guided to the base of a very large tree where at dusk, we were fortunate to observe a group of Eastern Tarsier (Tarsius spectrum) hopping from branch to branch and occasionally stopping to pose obligingly for us. The following morning we got up at a ridiculously early hour and went on a long walk through the forest. 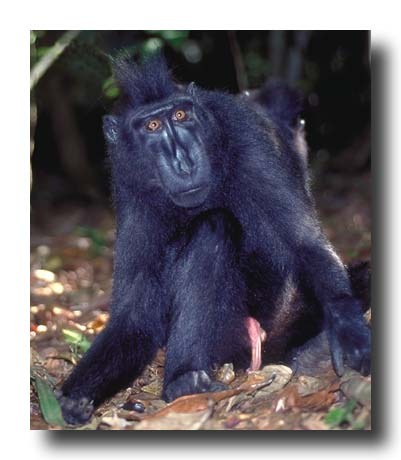 We eventually found a large group of the Black Macaque Monkey (Macaca nigra). The monkeys were in a large group of perhaps 50 and were constantly moving through the forest. We stayed with one group of them for quite a while and were occasionally able to get very close to them. In summary, the trip was most enjoyable and provided many superb underwater photographic opportunities. Although we were there just before the outbreak of fierce hostilities in East Timor there was no unrest in the North Sulawesi region.